Chicken, Chicken Broth, Crab, Tapioca Starch, Egg Whites, Apples, Carrots, Sweet Potato, Natural Flavor, Tricalcium Phosphate, Choline Bitartrate, Taurine, Calcium Carbonate, Dandelion Greens, Potassium Chloride, Vitamins (Vitamin A Palmitate, Vitamin D3 Supplement, Vitamin E Supplement, Thiamine Mononitrate, Niacin, d-Calcium Pantothenate, Riboflavin, Folic Acid, Biotin, Vitamin B12 Supplement), Minerals (Zinc Amino Acid Chelate, Iron Amino Acid Chelate, Copper Amino Acid Chelate, Manganese Amino Acid Chelate, Magnesium Amino Acid Chelate, Iodine Amino Acid Chelate, Sodium Selenite). 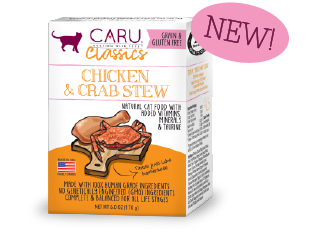 Caru Chicken & Crab Stew is formulated to meet the nutritional levels established by the AAFCO Cat Food Nutrient Profiles for all life stages. For adult cats, feed 1 pack per 6-8 lbs. of body weight per day. Kittens require up to two and a half times this amount. For pregnant and lactating females, allow free access to food. Adjust the amount of food to meet your cat’s individual needs. Food should be fed at room temperature. Always provide access to fresh water. Available in 6 oz (170 g) packs, 12 cartons per case.